As thousands around the world mourn Superman, Steppenwolf and his legions of Parademons return to Earth to find the three Mother Boxes. Steppenwolf aims to connect all three in order to form “The Unity”, which will terraform Earth in the image of Steppenwolf’s homeworld. While the boxes are guarded by Amazons, Atlanteans, and mankind, they are no match for Steppenwolf. These include Arthur Curry, Barry Allen and Victor Stone, the alter egos of Aquaman, The Flash and Cyclops. The disjoint team plans to use their complementary skills to battle Steppenwolf, but can they possibly defeat him without the help of Superman? Warner had pinned a lot of hopes on Justice League to deliver for the DC Extended Universe, making it a key title for the studio. Perhaps it was somewhat due to the poor reviews, but I actually found that the movie exceeded my expectations. I welcomed the humour that lightened the tone of the normally super-serious DC films. Along with the cast of Batman v Superman, the new additions were pretty solid. Ezra Miller had a somewhat delightful performance as The Flash, while Jason Momoa added gravity and respect to the character of Aquaman. Of course Gal Gadot added the human touch and I still think Ben Affleck is a pretty decent Batman. While it has been criticized for being uneven, for me the film was a pretty fun adventure and was well paced. Overall I recommend Justice League for superhero and comic book fans, especially those who are fans of the DC Universe characters. The cast includes Ben Affleck, Henry Cavill, Amy Adams, Gal Gadot, Jason Momoa, Ezra Miller, Ray Fisher and Jeremy Irons. Justice League was directed by Zack Snyder, who was also behind movies like 300, Dawn of the Dead, Legend of the Guardians: The Owls of Ga’hoole, Man of Steel, Watchmen: The Ultimate Cut, and Batman v Superman: Dawn of Justice. Reviews for the film were mixed, with a Rotten Tomatoes score of 40%. It was met with a more positive public response, earning an IMDb score of 6.8/10. Justice League was probably a disappointment for the studio in the cinema, taking in $229M at the US box office, for a worldwide total of $657M. The video on the disc is an AVC 1080p encode at 22 Mbps, and is presented at 1.78:1 aspect ratio, filling the HDTV screen. The stylistic look of the movie is quite dark and gritty, which makes it harder for any given scene to ‘shine’ so to speak. That said the video encode is solid and delivers on the artistic intent for the movie. 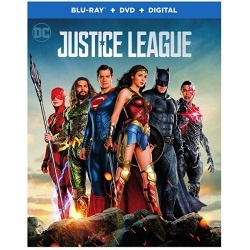 Check out the details page for Justice League to see full resolution PNG screen captures taken directly from the disc. The main audio is Dolby Atmos object based audio, and as always it is great to see this included on the Blu-ray Disc where studios like Fox, Disney and Sony only feature object based audio on the Ultra HD releases. The disc is a dual layer BD50, with 40.9 GB used and is coded for All Regions. As you might expect, the Blu-ray release for Justice League has a slew of supplements and bonus materials covering the film and the history of the Justice League characters. A few deleted scenes give more details on how Superman returned to his world-saving self. Some 50 years of Justice League history in multiple formats are discussed by historians and experts. Key moments are listed as we cover each decade. The first moving pictures for the Justice League were animated versions. The core trinity of Superman, Wonder Woman and Batman are covered in this featurette. The film makers, cast, and crew talk about the characters and how they are inspired by them. The gadgets and add-ons for each of the characters are covered in this segment. Naturally Batman is perhaps the biggest user of technology, and we get an inside look into how the film makers designed them. The Flash also has a technologically advanced costume and Cyborg is of course literally half alien technology. Cyborg, Aquaman, and Flash are new characters in the DC cinematic universe, but they have a deep history in DC Comics. The actors weigh in on bringing these new characters to life. The ‘bad guy’ in the movie gets his moment in the spotlight in this short featurette. A series of segments that delve into specific key scenes from the movie. A fresh look into the world of the Amazons as they try to protect the Mother Box, including story boards and pre-visualization versus the live action. Wonder Woman takes on the terrorists in London. Superman has been reborn and the Justice League confront him in Heroes Park. The last Scene Study covers the battle with Steppenwolf and his minions in the tunnel under the harbour. Here we dig into the wardrobe for the various characters of Justice League. Here the designers discuss the long road from original concept drawings to the ‘final product’ for each of the characters. This release includes a DVD Copy for legacy players and a Movies Anywhere Digital Copy code. Justice League is a fairly solid superhero action movie that comes across as lighter in mood than previous DC Extended Universe titles. Warner Home Video has put together a technically strong Blu-ray release with Dolby Atmos audio and over an hour of supplemental features. The retail price is $35.99, though you can get it at Amazon for $24.96, saving 31%! Fueled by his restored faith in humanity and inspired by Supermans selfless act, Bruce Wayne enlists the help of his newfound ally, Diana Prince, to face an even greater enemy. Together, Batman and Wonder Woman work quickly to find and recruit a team of metahumans to stand against this newly awakened threat. But despite the formation of this unprecedented league of heroesBatman, Wonder Woman, Aquaman, Cyborg and The Flashit may already be too late to save the planet from an assault of catastrophic proportions. This entry was posted on Thursday, March 22nd, 2018 at 8:00 pm	and is filed under Action, Adventure, Atmos, Blu-ray, Commentary, Fantasy, Sci-Fi, Science Fiction, Super Hero, Warner. You can follow any responses to this entry through the RSS 2.0 feed. You can skip to the end and leave a response. Pinging is currently not allowed.